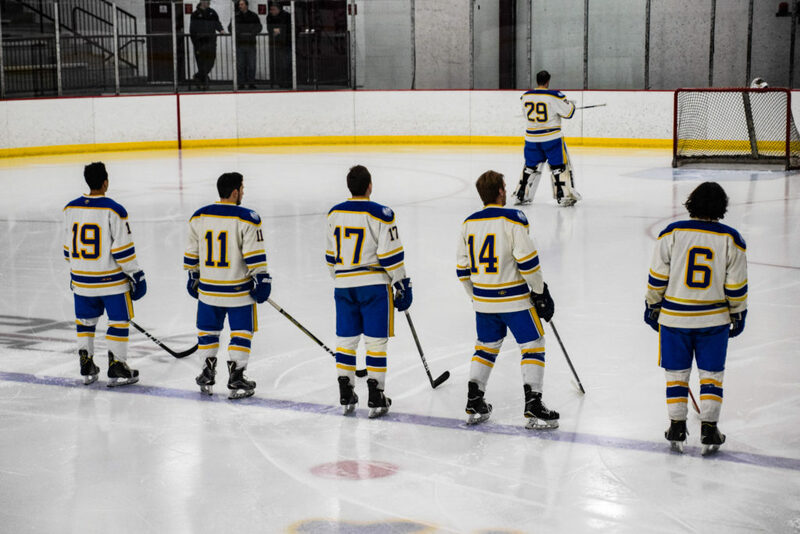 HARMAR Twp., Pa — The Pitt Panthers trimmed their magic number for a playoff berth to one over the weekend by defeating the John Carroll Blue Streaks 4-3 on Friday night and dominating the Mercyhurst Lakers on Saturday, 6-1. Meanwhile, the Duquesne Dukes clinched a conference playoff berth with their own win over John Carroll Saturday, defeating them 6-3, with all six goals coming in the third period. The Dukes completed their weekend with a non-conference matchup against the Delaware Blue Hens, falling 5-2. The Panthers got on the board just over the midway point of the first period Friday night against John Carroll on a goal by Alec Bosnic his second of the season. John Carroll defenseman Anthony Pontello tied the game 1:41 into the second period. The Panthers began taking momentum away after that goal, as Jacob Tepe scored two of his own at the 10:44 and 17:18 marks of the period to give his team the 3-1 lead. In the third, it was the Blue Streaks’ turn to notch two goals, as defenseman Max Zweirlien and forward Chris Laliberte scored at 4:28 and 7:27 of the period, respectively. Midway through the period, Bernardo Vieira broke the tie for the Panthers with his second goal of the season and Pitt held on to earn the 4-3 victory. IUP, Slippery Rock, and Duquesne all clinched playoff spots for the CHMA Tournament (to be held March 1-3 at Alpha Ice Complex) thanks to Pitt and Duquesne each beating John Carroll over the weekend. Slippery Rock clinched with their victory over West Virginia Saturday night. The Pitt Panthers can clinch a playoff spot by defeating West Virginia in one of their two matchups in the home-and-home weekend series on February 8 – 9. The West Virginia Mountaineers notched their first conference win Friday night, defeating Mercyhurst 4-0. IUP holds the head-to-head tiebreaker over both Slippery Rock and Duquesne, defeating each once so far this season. Slippery Rock holds the tiebreaker over Duquesne by having 8 non-shootout conference wins. The Dukes have only seven, thanks to their shootout victory over Robert Morris on November 16. Robert Morris needs two wins and a John Carroll loss to clinch a playoff berth. *NOTE: A previous version of this story incorrectly listed West Virginia’s record as 1-5-3, giving them 5 points in conference play. Their loss to John Carroll was incorrectly recorded as a regulation loss instead of a shootout loss. It has been corrected and they currently have 6 points in conference play. We regret this error and apologize.